Tell Us About You When You Call! Are you ready to call Ms Isabelle or Ms Lily? If you are a first time caller, it will often help if you give us some information about you before you call in. 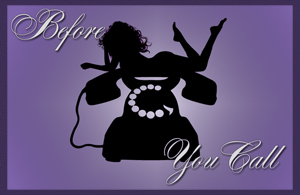 We know full well the effect that we can have on sissies like you, and you would not be the first…or last…to get tongue-tied when you are on the phone with us! Though it is not a requirement, you will get bonus points for extra credit work for completing it.